This undated handout photo, taken in 2001, provided by the Museum of the Rockies shows a bronze cast of the Tyrannosaurus rex skeleton known as the Wankel T.rex, in front of the Museum of the Rockies at Montana State University in Bozeman, Mont. The Smithsonian's National Museum of Natural History is acquiring its first full Tyrannosaurus rex skeleton for eventual display in a new dinosaur hall planned for the National Mall. The museum announced Thursday that it reached a 50-year loan agreement with the U.S. Army Corps of Engineers to display one of the most complete T. rex specimens ever discovered. It's known as the "Wankel T. rex. "The rare fossil was found in 1988 by rancher Kathy Wankel on federal land near the Fort Peck Reservoir in eastern Montana. 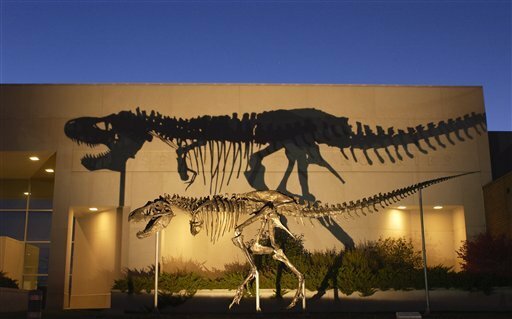 Between 1990 and 2011, the fossil was loaned to the Museum of the Rockies in Bozeman, Mont. The T. rex will be the centerpiece of a new dinosaur hall scheduled to open in 2019. Only a few museums display such nearly complete skeletons. The Wankel T. rex is prepared for exhibit in its original “death pose” at Montana State University’s Museum of the Rockies in 2005. The dinosaur died in a riverbed more than 65 million years ago and was discovered by Kathy Wankel near the Fort Peck Reservoir in 1988. As thunder boomed and lightning illuminated their small camper, Kathy Wankel couldn’t help but think that after years of being buried, the few fossilized bones she and her family had dug up that day, and carefully swaddled in towels and an old sweatshirt, did not want to be moved. “It was such a terrible storm, it was like saying ‘Don’t take those bones out of there,’ ” Wankel, 61, said in a telephone interview on Friday. Next week, the now nearly complete fossilized skeleton of the Tyrannosaurus rex dinosaur that Wankel discovered in 1988 in Eastern Montana will be shipped from the Museum of the Rockies in Bozeman to the Smithsonian's National Museum of Natural History. There, the Wankel rex will be on loan for 50 years as the centerpiece of the museum’s new 31,000-square-foot national fossil hall, which will open in 2019. Wankel discovered the fossil while walking along the edge of Fort Peck Reservoir near Nelson Creek on Labor Day weekend. Her husband, Tom, was strolling along the base of a ridge when he called to her on the above hillside to come and look at what he had found. “You better come up here, I think I’ve really found something,” she recalled responding to her husband. Only a small portion of the dinosaur was visible, she said, about the size of a knife blade. The bones were whitish grey and the bone marrow was visible. Tom got out his pocket knife and began scratching away the hardened dirt surrounding the bone, but the summer had been so dry and the ground was so firm that he soon gave up and they returned by boat to their camp across the water. Loading up the boat with more tools, their three children, her brother-in-law and his child, they returned to the spot and began chipping away. “I just had a feeling it was a mega find,” she said. But even with the extra tools, excavation proved difficult. At the end of the three-day weekend, the family had to return home. Montana’s governor stalled the Wankels’ return the following weekend when he closed all public lands to recreation because of extreme fire danger. In the fall of 1988, Yellowstone National Park was ablaze. The bones idled in the basement at the Wankel ranch north of Miles City until Thanksgiving. That’s when the family visited relatives in Bozeman and took the bones along to show to experts at the Museum of the Rockies. “I was pretty sure they weren’t buffalo bones,” Wankel said. As the museum’s Patrick Leiggi walked out to the station wagon to inspect the bones, Wankel had the feeling that he was kind of “ho-hum” about the task until he saw the fossils. Leiggi fetched the rest of the museum’s paleontology staff, which crowded around the bones, looked at each other but said nothing until Jack Horner, who is now regents professor of paleontology at the museum, asked if they could find the site again. The next year, they led the group to the site, hiking in from the McGuire Creek Road because the reservoir was too low to boat to the bones. Between 1989 and 1990, a crew from the Museum of the Rockies descended on the remote landscape, enduring searing heat, lightning that struck and demolished their outhouse, drenching rainstorms as well as rattlesnakes to remove tons of rock with jackhammers to unearth the meat-eating dinosaur. Although once displayed in its “death pose” near the entrance of the museum’s Hall of Horns and Teeth in the Siebel Dinosaur Complex, for the last few years the Wankel rex has been in storage. And in the intervening years, the museum has collected about a dozen T. rex fossil remains. Now retired from her position at Miles Community College in Miles City where she served as director of nursing, Wankel said she still likes to roam the vast Eastern Montana plains while looking for interesting rocks. But it will be hard to top her 1988 discovery. Because the dinosaur was found on public land managed by the U.S. Army Corps of Engineers, the bones are owned by the federal government. It was Corps officials who agreed to provide the fossil to the Smithsonian. The Wankel T. rex was estimated to have roamed Eastern Montana about 66 million years ago when the landscape more closely resembled swampy Florida than the rugged Northern Great Plains of today. About 85 percent of the skeleton was eventually unearthed. The fossil was also one of the first studied to see if biological molecules still existed within the fossilized bones. When alive, the Wankel rex was about 38 feet long and weighed 6 to 7 tons. Its age was estimated at 18 years, not yet fully grown. With teeth as large as bananas, the T. rex was one of the most ferocious meat eaters that ever roamed the earth. A cast of the dinosaur is on display at the National Museum of Scotland as well as a bronze version that stands in front of the Museum of the Rockies named Big Mike. The Wankel rex was scheduled to be transferred to the Smithsonian last fall to be unveiled on National Fossil Day, but the federal government’s shutdown halted the shipment. Festivities are planned in Bozeman on Friday at the Museum of the Rockies. The free festivities will run from 11:30 a.m. to 1:30 p.m. and will include a picnic, appearances by dignitaries and the museum’s mascot, Rocky Rex. A caravan down Main Street will begin at around 2 p.m. with a FedEx truck carrying the boxed-up Wankel T. rex. As the Wankel rex is unpacked in Washington, D.C., the Smithsonian’s technical staff will scan each bone so that the entire skeleton can be digitally reproduced virtually in three dimensions. The museum would like to eventually scan all of the available T. rex skeletons to compare the fossils to see any variations. 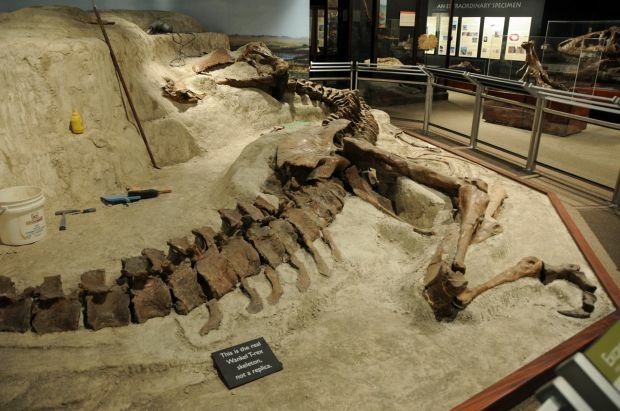 Tom and Kathy Wankel, and 20 members of their extended family, plan to attend the sendoff and travel to Washington, D.C., for the festivities planned there to welcome the fossil. “We just had such a great time, it was such a good experience for our family,” Wankel said. Yet part of her hates to see the T. rex leave the state, the exodus of one more natural resource. “I guess I’m just going to have to find another one,” she said, chuckling. WASHINGTON — A Tyrannosaurus rex is joining the dinosaur fossil collection on the National Mall on Tuesday after a 3,000-mile journey from Montana.